Place the peas, lemon juice, Greek yoghurt, extra virgin olive oil, dill and black pepper in your food processor and blitz until combined. 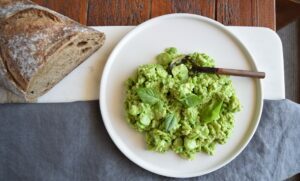 Add the broad beans and gently pulse until mixed – you want the broad beans to stay fairly chunky. Decant into a bowl and top with the crumbled feta. Serve with warm whole grain bread, or crackers and enjoy!